The U.S. Navy has ordered four newly designed yard tugs from Washington-based Dakota Creek Industries. 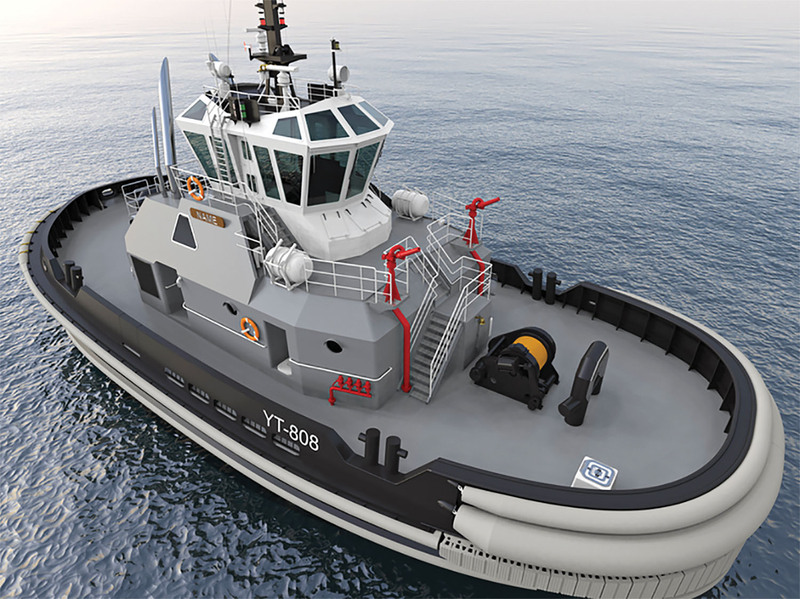 Each of the ASD tugs will be equipped with two rudderpropellers from Schottel Inc. Schottel, which is based in Houma, La., will be at the International Workboat Show in New Orleans, La., next week in booth No. 1527. The azimuth thrusters are provided with the DNV-GL-certified Leacon sealing system as well as Schottel ProAnode integrated into a high-efficiency nozzle. Just like the first six Navy tugs equipped with Schottel rudderpropellers that were ordered earlier, the Navy currently plans to deploy the four new tugs at military bases in the Pacific Northwest region and Yokosuka, Japan. They are intended to perform ship-handling duties for the full range of Navy surface warships and submarines. For this purpose, the tugs are equipped with an extensive array of underwater fendering as well as typical resilient style fenders for handling surface ships. The main propulsion for the Robert Allan Z-Tech-design tugs is provided by two Caterpillar CAT 3512E engines—each rated with 1,350 bare kilowatts at 1,600 rpm. and each featuring a Schottel SRP 340 (formerly SRP 1012) azimuthing stern drive unit with 2,100-mm.-diameter fixed pitch propellers and an input power of 1,330 kw. This combination will provide a bollard pull of 43 tonnes and a free-running speed of approximately 12 knots. The four newly built harbor tugs will be equipped with state-of-the-art technologies developed by Schottel. The high-performance nozzle SDV45 offers provable higher efficiency at open-water speed combined with very good bollard pull values. In addition, moving the position of the anode from the outside surface into the cross-section of the nozzle, Schottel’s ProAnode extends the life cycle of the thruster and protects the anodes against external impacts. Furthermore, it offers additional operational potential as it contributes to the optimal hydrodynamic flow of the nozzle. Since its smooth overall surface reduces flow interference, lower fuel consumption will pay off in terms of reduced operating costs. Due to separate seals on the seawater side and on the gearbox side, the Schottel Leacon sealing system ensures that seawater entering the system and gear oil escaping from the system are collected in an intermediate chamber. The sealing system prevents water from entering the gearbox and, in particular, oil from escaping into the seawater. This means that Schottel systems with Leacon are now exempt from the current VGP regulations of the Environmental Protection Agency. The Navy tugs are expected to enter operation starting in November 2019. Schottel Inc.’s U.S. headquarters is in Houma, La.